William McEachern will speak on the topic Robert E. Lee's Real Plan at Gettysburg. Bill is a member of our Round Table and has addressed us a number of times in the past. William D. McEachern is a graduate of Duke University with a bachelor of arts in religion and psychology. His focus at Duke was on early Christianity. His fascination with Rome grew out of his Latin and Greek classes at St. Paul’s School in New York in the early 1960s. Reading Caesar fueled his love of Rome and ancient history, which he has studied for half a century. A practicing tax attorney for more than thirty-five years, he has written numerous articles and several law treatises about estate planning, estate and gift taxation, and the use of trusts. In this his first novel, Mr. McEachern’s unique voice blends law, religion, and history. Williams Hines, a retired park ranger, spoke last month. His topic was Civil War Transportation. The over all theme of the presentation was the impact of the industrial revolution. This included steam power, telegraph, fountain pen, education, and the industrial scale of all enterprises. If it were not for the railroad the Midwestern states might have gone over to the Confederacy. This is because a pre-industrial section depended on river transportation. The drainage basin of the rivers west of the Allegany mountains was the Mississippi River. With the Railroad Act of 1862, the United States government paid for rail transportation. This meant that products from the Midwest were at a competitive advantage travelling east and not south. Herman Haupt was an American civil engineer and railroad construction engineer and executive. 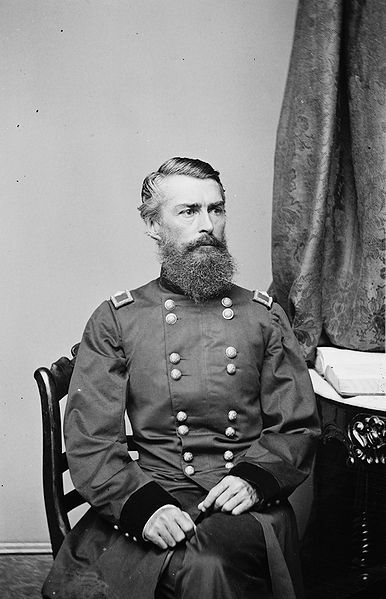 As a Union Army General, he played a key role in the use of railroads. He supervised the operations of large-scale railroad transportation used to move and supply armies rapidly over long distances. Although he often did not have legal authority, in fact he “owned” the technical people that built the equipment and ran the trains. Almost every battle of the Civil War was fought near a railroad station. He is remembered for the many bridges he built or had reconstructed. During the war the North built 400 engines and 20,000 boxcars. Mr. Hines discussed river transportation which was enhanced by the capture of New Orleans and the fall of Vicksburg. Once away from rivers and the railroads the Union Army depended on road transportation. This was the weak link of logistics. The army was stuck using the standard mule pulled wagon. Bob Franke, a member of our Round Table, has made a generous donation of thirty pieces of Civil War art, currency, and stock certificates. All the items will be available for purchase. All proceeds will go to the Round Table. Some items will also be in the monthly raffles. Each item is framed, under glass and in mint condition. This is a wonderful opportunity to add to your collection. The following is an inventory of the items for sale. Round Table members will have the first opportunity to purchase these wonderful treasures. 5. A series of numbered sketches by B. Horton, 8 X 10 individually framed and under glass, valued at $400.00. Included in the series: Robert E. Lee, Beauregard, Nathan Bedford Forrest, A.P. Hill, Kirby Smith, Stonewall Jackson, Richard Taylor, Robert Rhodes, Jeb Stuart, James Longstreet, and Benjamin Cheatham. 15. 1863, $1000.00, Confederate Bond with only one coupon missing. Individual sketches of Stuart, A.P. Hill, Lee, Early, Longstreet and other officers, 4 x 6.